Parents with babies on the Neonatal intensive care unit (NICU) at the University Hospital of Wales are now able to keep in touch with their little ones when they are away from their baby’s bedside thanks to vCreate secure video messaging which has recently been implemented on the unit, which is the first in Wales to use such a service. vCreate is a secure video messaging service that lets unit staff record and send secure video updates to parents when they’re unable to be by their child’s side, minimising the separation anxiety felt by parents. 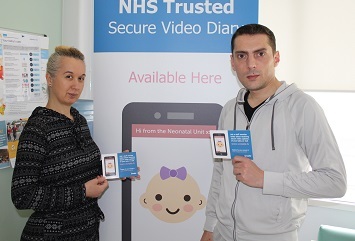 New mum, Nina Bucur, received a Vcreate video from her little boy Eric on Mother’s Day, Nina said: “We have been waiting for almost 14 years to have a baby. I didn’t feel well with pain and I was having contractions so came into the hospital to be checked out. “My baby, Eric Fabien Bucur was born on 18 February weighing 900 grams at a gestation of 24 weeks and 3 days. “The staff here are beautiful, I don’t have words to describe how I feel about the care we have received on the unit, they are just beautiful. On a scale of one to ten, I would give them a 10 definitely. “It was hard to adjust at first because ‘I’m Eric’s mum, I know what’s best for him’ but they quickly gained my trust. The staff are there 24 hours a day, if anything happens they are there, through the ups and downs, always by his side, getting him better. Mary Glover, Lead Nurse for Acute Child Health at the Noah’s Ark Children’s Hospital for Wales said: “We aim to offer the very best care and support to new-born babies and their parents or carers, and using technology like this helps us give that little extra reassurance to parents at a very difficult time. “Many parents have other children and responsibilities, so being with their baby all the time is impossible. It’s been so rewarding for us to use technology to keep that bond going when it’s not possible for the whole family to be together.